More than 100 Golden Bulls packed Grimes Lounge Oct. 9, 2017 to learn about popular Mexican festival Día de los Muertos (Day of the Dead) with celebrated Charlotte artist Rosalia Torres-Weiner. 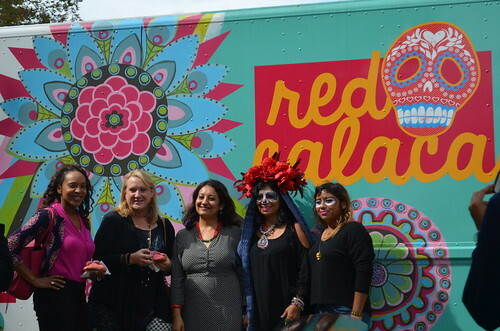 Torres-Weiner presented the art showcase “A Celebration of Life” and brought her mobile art studio to The Block. Dozens of students munched on pan de muerto (bread of the dead), mounds of dough sprinkled with colored sugar and topped with baked crossbones, while hearing Torres-Weiner speak about the symbolism of altars, marigolds and other aspects of the ancient tradition. Following the presentation, students were invited to tour the mobile art studio parked on The Block. Inside were an array of Torres-Weiner’s mixed media paintings, including one titled “Black Art Matters,” dedicated to the work of artist Dread Scott. Torres-Weiner is chief executive artist of Red Calaca Studio, and an activist and community leader in Charlotte whose work captures the themes, colors and rich symbolism of her native home of Mexico. She started off as a commercial muralist, and has been creating art in Charlotte for more than 10 years. Torres-Weiner founded the Papalote Project to help the children affected by the deportation of their parents deal with the emotional trauma caused by the separation. The children create kites (papalotes) incorporating remnants of their parent’s clothing and release them, symbolically sending their love to them and beginning the journey to heal. She will be inducted into the Smithsonian Institution Museum Oct. 29, 2017.